Nape is regarded as one of the sexiest body parts of a woman. When it comes to getting inked, people are very cautious in choosing tattoo designs because the neck part in general is best known as a spot for sophistication and elegance. On the other hand, the nape, or the back of the neck, is one place where you can get basic designs or perplexing patterns tattooed. It is a location where you can experiment with loud as well as subtle designs. Placing a print in your nape gives you the sole authority of your tattoo’s appearance, it’s up to you whether you like your tattoo to be visible or not. 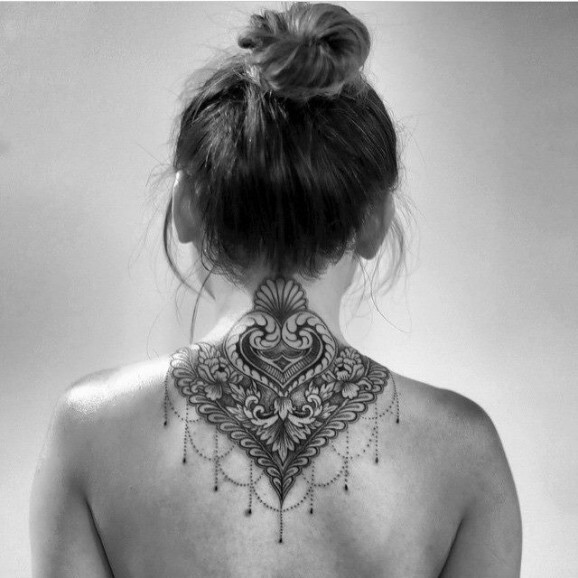 If you are looking for inspirations of nape tattoos, here’s a rundown on some ideal designs to get. If you’re a nature enthusiast, you may find yourself wanting to have a print associated with flowers, trees, animals and other environment and cosmos related elements. Having a symbol tattoo is certainly a good idea. Whether it’s Mandala, Celtic, Religious, Zodiac or anything will do, as long as it relates to your life or personality. Let your chosen symbol tattoo speak for itself. Tattoo is such a rich way to express one’s beliefs and anything significant in life. Geometric shapes tattoo is gaining its popularity in the tattoo industry. The remarkable patterns, peculiar combination of shapes and the unconventional type of layout are some of the factors that make Geometric Shapes Tattoo standout. These 3 are the most common preferred designs for nape tattoos. They’re plain yet pleasant to the eyes. However, behind their simplicity, they do have deeper meanings. Initials, words, and numbers tattoos may be associated with unforgettable experiences, significant other, celebrations or misfortunes. Below are some of the loveliest prints for girls.